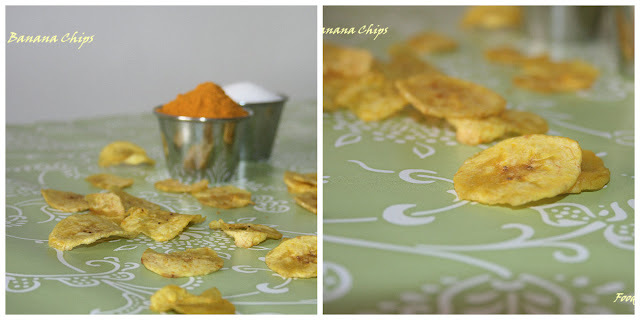 Banana Chips are the all time favourite snack. These are the fried version of banana slices spiced up with tumeric and salt. People love to fry these chips in coconut oil. But I never use coconut oil in my cooking so fried them in normal canola oil. Some people for healthier version try these chips by baking or sometimes dehydrated. Wash the plantain thoroughly in water. Cut both the ends and peel the skin of the plantains. Take about 2 cups of water and mix in turmeric powder and salt. Then slice the peeled plantains into this water mixture and keep it immersed in water mixture for at least 10 to 15 minutes. So that taste of salt gets into the chips and also the chips will get nice yellow color due to turmeric which is added into the water. After 15 minutes, you need to take out all the chips and pat dry them on clean kitchen towel . Meanwhile heat oil into the frying pan. 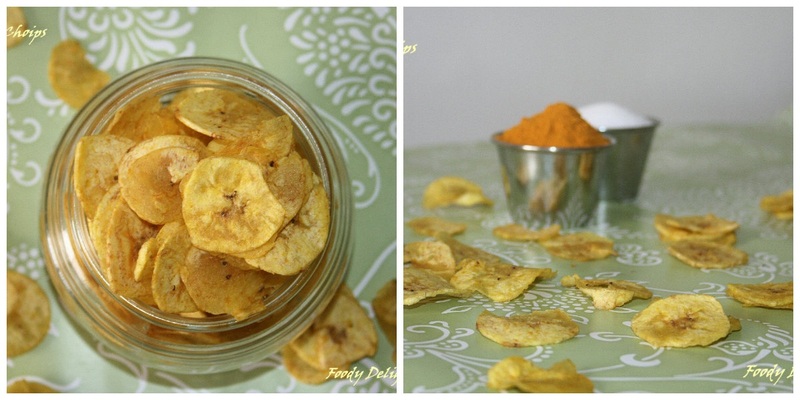 When oil is hot, carefully add the dried banana slices and fry till these crisp. You can make out with sizzling noise that comes while frying the chips. If the sizzling sounds stops then the chips are done. Drain them on paper towel and enjoy with hot cup of tea or coffee. I have seen that while peeling the raw banana skin, our fingers gets black. The small tip to avoid is apply few drops of oil onto your palms before you start peeling the raw bananas. Also another method is you can immerse plain banana slices into water. Then spice them with tumeric powder and salt and fry till crisp. Omg, who will say no to these crispies, super addictive beauties.